Welcome to Hinode Monogatari, the Legend of the Five Rings Tales of the Sunrise campaign. This section of the site will be hosting the campaign records, any material that the players want to post, and supplemental campaign background material. Major Characters: Asahina Ninsei (child prodigy fire shugenja), Neko Miyako (a cat clan skillmaster), Tamori Kochige (shugenja-sumo wrestler), Smoke Balamada, Senpet Heka Mage (The Heka Magic rules, along with a lot of other stuff, can be found in the Campaign Handout PDF), Bayushi Michio, Phoenix-Schooled Scorpion Bushi, back in the days when he was only extremely deadly, rather than a menace to the structure of reality, Neko Miyako, a powerful Cat Clan Samurai, Ambir Ryuko, A Dragon-Shapeshifter, Bayushi Sakura, a Tainted Scorpion Bushi, Toku Najite, a very high-ranking Monkey Clan Bushi, and the Madness Tattoos currently sported by Kochige’s Son (plus his base abilities – which aren’t much at his age). 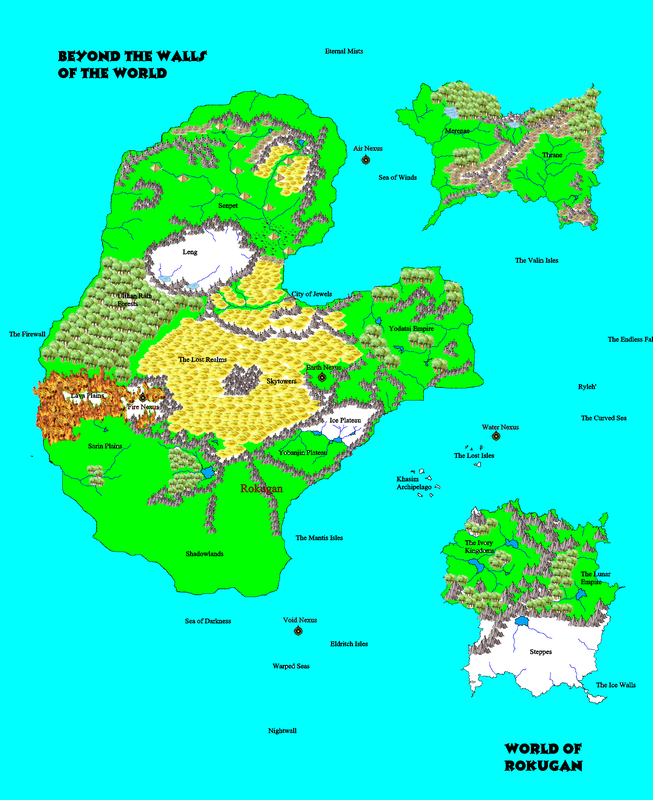 Maps and Locations: Rokugan Area Map, Rokugan World Map (and an updated, and vastly improved, version: Rokugan World Map – at least the way it is in Tales of the Sunrise), Toshi Ranbo Circa 1124 Information and Full Scale Map, Alex’s Fief Information and Full Scale Map, and Naga Forest Map Key. Schools: The Guardians of Traitor’s Grove, Master of the Hidden Mountain, Tiger Clan Sohei, Ivory Kingdoms Geisha School, the Mandate of Heaven School of Rulership, Yobanjin Spirit Binders, Meishou Shokunin Master Smith Bushi School, The Spellstorm School and Technique, Jade Guardian Monk School, Iron Guardian Yojimbo, Yodatai Scout School, Ivory Kingdoms Geomancer School, the Demon Mirage Ivory Kingdoms School, the Recondite Weave school of gaijin void magic, Techynics (an Ivory Kingdoms school of magic), the Chikao Ronin Commander/Administrator School, the Taimushifuto Mugen (Timewarping Dream) courtier school, the Munashii Ji / Volgaren Merenae void manipulation courtier school, the Secrets of the Elders school of age, the Meditations of Unity School Ivory Kingdom Courtier School, Ronin/Nezumi Technician School, a Pre-Imperial Hadai Knight School, the Mountain Heart School of Earth Magic, The Ivory Kingdoms Rahu-Ketu School of the Midnight Sun (a school for light and shadow magic), the Ivory Kingdoms Dheramada School (a school for imbuing agents with power), the Fox Clan Temple Administrator Courtier School, the Walking Dream (Nezumi) Courtier School, the City of Jewels Evil Grand Vizier School, Hosfera Madrase Old Yodatai Divine School (beast-archery), Merenae Morgantha “Ninja” Courtier School, the Sparrow Clan Calligraphy School, Sagmahi Kashti Madrase old Yodata Divine School (far-traveling), the Thunderbolt Blade Bushi School, the Timeless Wanderer Bushi School (for planar travelers), and Capsule discriptions of twenty-one other Ivory Kingdom Schools. The two Cat Clan Minor Schools are in the compiled handouts or can be found at the end of Neko Miyako’s Character Sheet. We also have the Cheese Wheel Schools – or ” How to get Techniques without Ranks”. Compiled Player Handout Book (PDF Download. Includes basic rules, character creation system, new advantage and disadvantage system, customizable skill style system, new equipment, design rules for custom schools and techniques, expanded spell manipulation, Mudra, Shadow, Art, Peasant, Psychic, Sensory and Reflexive magic, Heka, Jinn, Mantra, Rune and Totem Magic, Kabari, Techynics, The Recondite Weave, expanded Combat Maneuvers, Social Maneuvers, Mercantilism, Demographics, Kata Creation, rules for playing Gaijin, and some other extras). Updated Player Handouts. This is a subindex page. It currently contains crosslinks to the information on Techynics, new Advantages and Disadvantages, Merchantalism, the Guuzou Kami spell list, Elemental Physics, The Recondite Weave school of gaijin void magic, Peasant and Eta Heritages, Jade Magic (some of Kitsune Okari’s spell research notes), and Political Positions. Future Imperfect: The timeline leading to the Thousand Years of Darkness. The Tell of the Black Scrolls: Which scrolls have been found, opened, or destroyed. Around Toshi Ranbo: The neighboring political leaders and vassal families. Lion Clan Politics: The current Lion Clan Champion and Family Daimyo. Character Objectives: Some things the characters are up to. The Current Strategic Positions for the upcoming Clan War – along with the slightly-prior Clan LIneups which led to them. Summaries for the current Player Characters situations. How to build an Asura or Deva character (towards the bottom of the entry), along with a quick list of (and a few notes on) the Asuras and Devas encountered so far. Shigure: On Warfare: Shigure’s rules for winning wars. Shigure: On Administration: Shigure’s rules for running the world. Shigure’s Tale: Shigure’s version of what’s been going on. Ninseis Secret Diaries: Reflections on Power: Ninsei’s reflections on rulership. Ninsei’s Secret Diaries: Legion Edition. The Nadare Family, and their Master of the Hidden Mountain Minor Bushi School. The Tiger Clan and their minor Sohei school. Shigure’s Goals. A bit on Shigure’s current purposes. Shigure in Hell– Shigure’s plans for leading a rebellion in Jigoku. Campaign Log: Compiled (Pre-Blog) Sessions, Vortex of Time Series, Part 1, Part II, Part III, Part IV, Firestorm Series, Interludes, The Phoenix Debates, The Borderlands of Twilight, The Drunkard’s Walk, The Rise of Fu Leng Series, The Clan Wars Series, The Bloodsword Legacy I, The Bloodsword Legacy II, Clan War Sequence II, The Clan War Openings, The Planar War, The Ivory Kingdoms, The Deva’s Tale, Sessions 87-89, Session 90, Session 91, Sessions 92-93, Sessions 94-95, Sessions 96-97, Sessions 98-99, Sessions 100-101 (sorry, the discriptive titles were becoming a nuisance to track). To help keep the many sessions which made up each of these straight, here’s a Session Titles Index – with session log crosslinks and upper karma limits for new and replacement characters.